Few things are as important to our nation’s future as the education of our children. In recent years, many groups have called for an increased focus on “STEM” education, an acronym for “Science, Technology, Engineering, and Mathematics.” Our Sacramento school injury attorney agrees with the need for strong science education and understands the role laboratory experiments play in many science fields. However, school must work to ensure that students are safe, whether behind a desk or conducting a science experiment. On Monday, as reported by the Sacramento Bee, two eighth graders at an Elk Grove middle school incurred minor burns during a chemistry experiment. The class was conducted at a park neighboring the Joseph Kerr Middle School and the experiment involved chlorine tablets and rubbing alcohol. Although the teacher conducted the actual experiment, somehow the two students were exposed to the chemicals after the reaction occurred. Fire officials responded to the accident. Family members took one student home and the second went to the hospital at his parent’s request. According to Elizabeth Graswich, an Elk Grove Unified School District spokesperson, district officials are looking into whether the experiment followed all proper safety procedures. 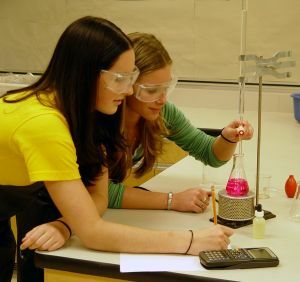 The National Science Teachers Association has an official position statement on “Liability of Science Educators for Laboratory Safety.” The group recognizes the usefulness of lab investigations but also notes the inherent potential for injury in lab work and the need for teachers, school districts, and board members to devote attention to safety in science education. As noted in the statement, teachers have a duty of care to ensure that students, teachers, and staff are safe. This is a legal obligation requiring that teachers conform to a standard of conduct that protects against unreasonable risk. Generally, this is a “reasonably prudent person” standard and the teacher must act as a reasonably in creating and maintaining a safe learning environment. Failure to meet this standard, known in the legal field as a breach of the duty, may lead to liability for both the teacher and school. Other officials, including leaders at the school and district level, also must meet legal standards of conduct. In Florida, this includes a duty to supervise pursuant to a reasonable person standard. Communication is an essential element of meeting these standards. Teachers should keep officials informed about existing or potential risks and school leaders should make sure educators are aware of all safety policies. Schools must also develop, review and update informed safety guidelines and training requirements. Another key element is maintaining safe equipment in all classrooms, especially in places like laboratory areas that carry extra risk. Staying abreast of the law and carrying adequate insurance are also part of school safety. Education can only be effective when students are safe. If your child suffers an injury at a Sacramento school, or any school in the Northern California region, please call our team. We offer a free consultation and Attorney Brod will review your case and determine whether you have a legal claim against a teacher, school district, or other person or group. Remember, most injury cases are handled on a contingent fee basis meaning you only pay attorney’s fees if you recover compensation.